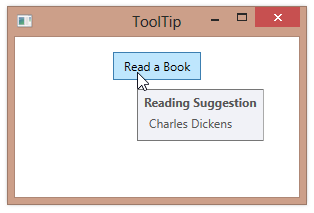 By default, a ToolTip will be displayed for 5 seconds before automatically disappearing. To change this value, set the ToolTipService.ShowDuration property on the element to which the tooltip is attached. In the example below, we change our tooltip to only stay displayed for 2 seconds (2000 milliseconds).